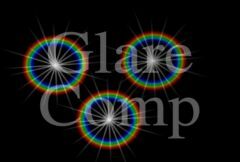 Generates rainbow halos and/or glint-like rays at locations where the Source clip is brighter than the threshold, and combines them with the Back input clip. This is similar to Glare but here the glare source and background can be different clips. Back: The clip to combine the glares with. Source Opacity: Default: 1, Range: 0 or greater. Scale Back: Default: 1, Range: 0 to 1. Glare Under Src: Default: 0, Range: 0 to 1. Glare From Matte: Default: 0, Range: 0 to 1.